Black Rock Mill was the center of a diverse farming community extending along Black Rock Road. 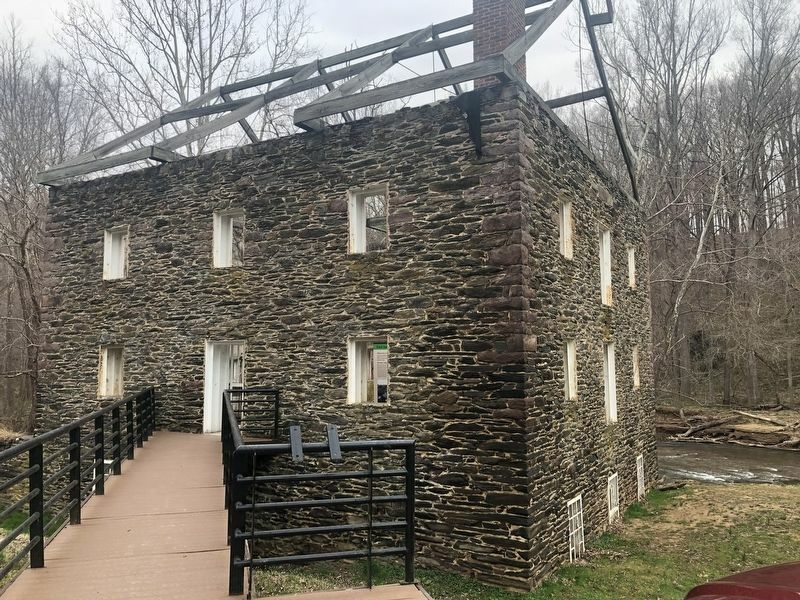 Nicholas Dorsey Offutt, a member of the Maryland House of Delegates and a successful businessman and merchant, purchased the mill in 1866 and built a handsome new miller's house on a hillside overlooking the mill. Across the creek, neighbors William and Elizabeth Hughes established a prosperous grain and dairy farm. Their son Charles Wallace Hughes married a daughter of the master miller and studied the milling trade. He became the last miller at Black Rock Mill around 1921. 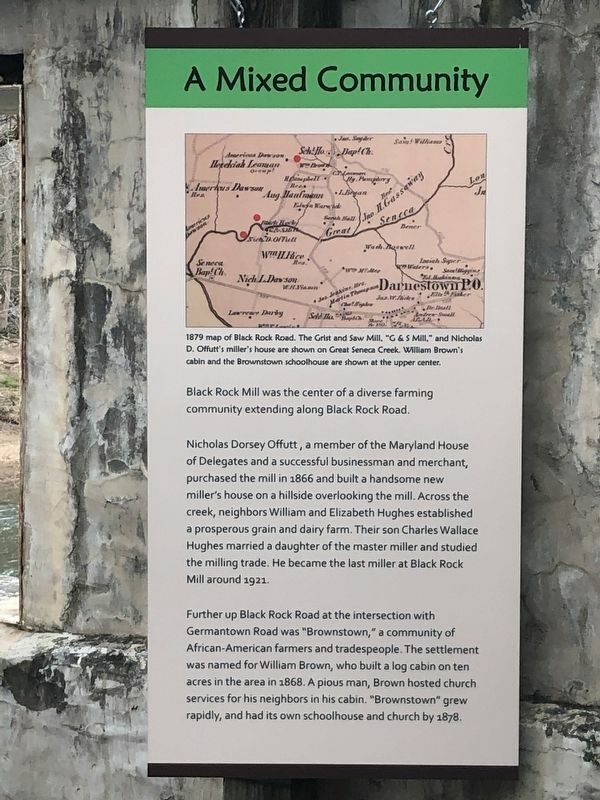 Further up Black Rock Road at the intersection with Germantown Road was "Brownstown," a community of African-American farmers and tradespeople. The settlement was named for William Brown, who built a log cabin on ten acres in the area in 1868. A pious man, Brown hosted church services for his neighbors in his cabin. "Brownstown" grew rapidly, and had its own schoolhouse and church by 1878. The marker is inside the old mill. 18.879′ W. Marker is near Germantown, Maryland, in Montgomery County. Marker can be reached from Black Rock Road north of Grey Pebble Way, on the left when traveling north. Touch for map. Marker is at or near this postal address: 16500 Black Rock Road, Germantown MD 20874, United States of America. Touch for directions. Other nearby markers. At least 8 other markers are within 2 miles of this marker, measured as the crow flies. How the Mill Worked (here, next to this marker); Black Rock Mill and Great Seneca Creek (within shouting distance of this marker); White’s Ferry (approx. 1½ miles away); Darnestown (approx. 1.8 miles away); The Signal Corps and Wartime Communications (approx. 2.1 miles away); The Civil War in Darnestown (approx. 2.1 miles away); Civil War Troops & Darnestown Residents (approx. 2.1 miles away); Darnestown: A Strategic Point of Defense (approx. 2.1 miles away). Touch for a list and map of all markers in Germantown. More. Search the internet for A Mixed Community. Credits. This page was last revised on March 31, 2019. This page originally submitted on March 30, 2019, by Devry Becker Jones of Washington, District of Columbia. This page has been viewed 77 times since then. Photos: 1, 2. submitted on March 30, 2019, by Devry Becker Jones of Washington, District of Columbia.